You’ve seen them all over Insta, and I’m not mad about it – the trench coat. I purchased this one while during NYFW at the SheIn pop up and I love it! I had been looking for a trench coat for a while, but I wanted something affordable and a little different. 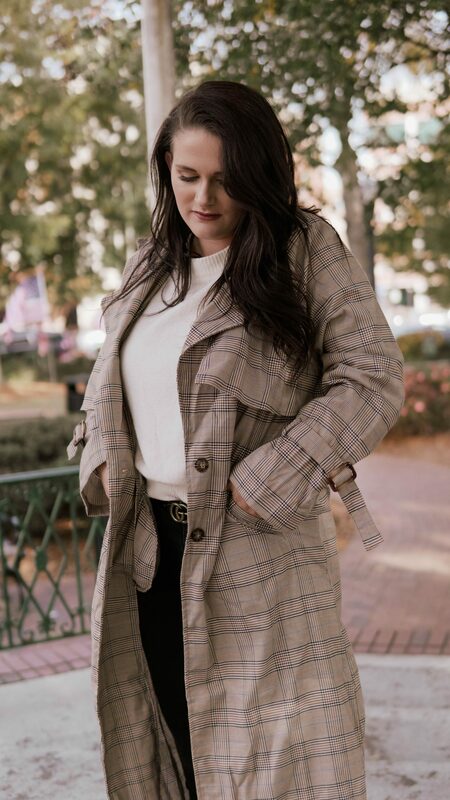 While there are a lot of plaid trenches on the market right now, there’s many reasons I love this one. Probably the number one reason why I love this trench is because it’s lightweight and packable. 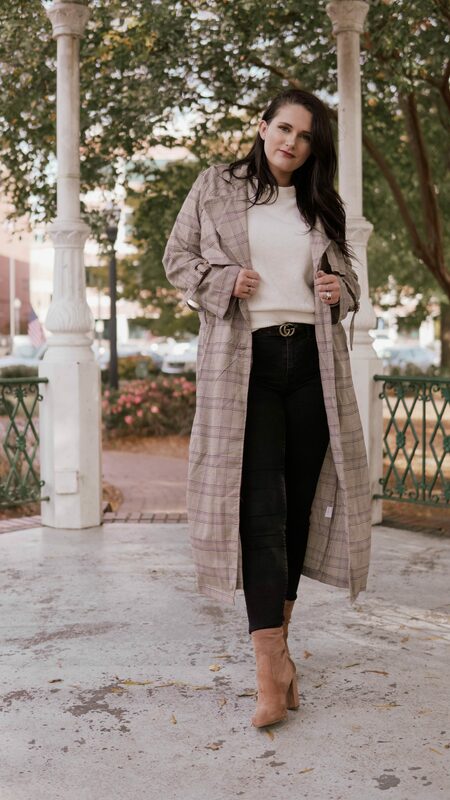 Whether you’re hopping on a plane, or you’re a commuter and need to throw it in your bag, this trench is great for someone on the go. 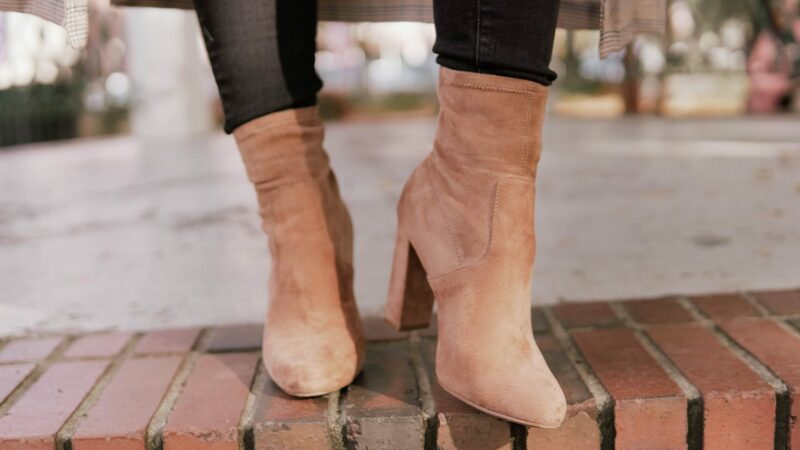 Because it’s lightweight, it makes for a great layering piece. Here, I paired it with a basic sweater and jeans. 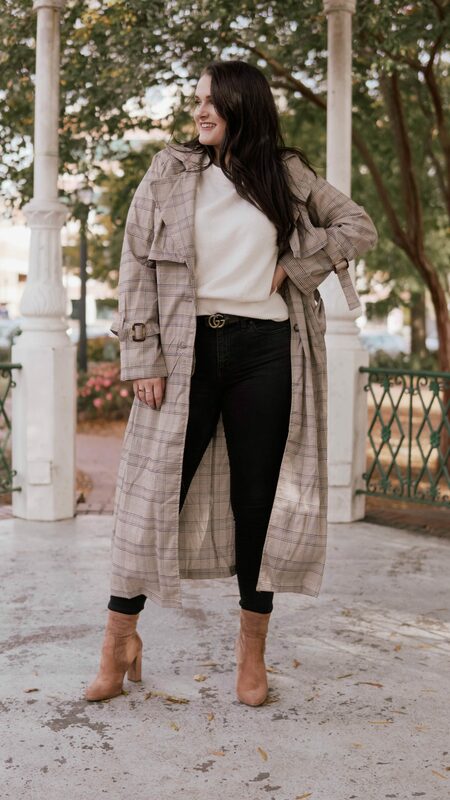 But if it were a bit cooler outside, you could easily style this trench coat over a thicket sweater or even another jacket. I chose a size small because when I was in the pop-up and trying them on, I noticed that my usual size (medium) was a little too big. Another great thing about the coat — it’s not too long for me! I am a little under 5’5″ and while that isn’t that short, it’s sometimes hard to find long coats that aren’t an awkward length on me. 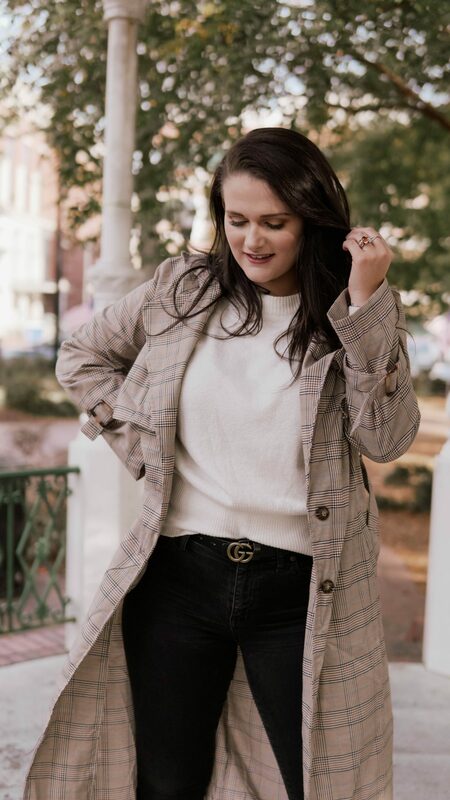 When it comes to styling a trench, there are so many different options, which is just another reason why I love this trend! I’m all about versatility and shopping for items that can be worn for multiple occasions. 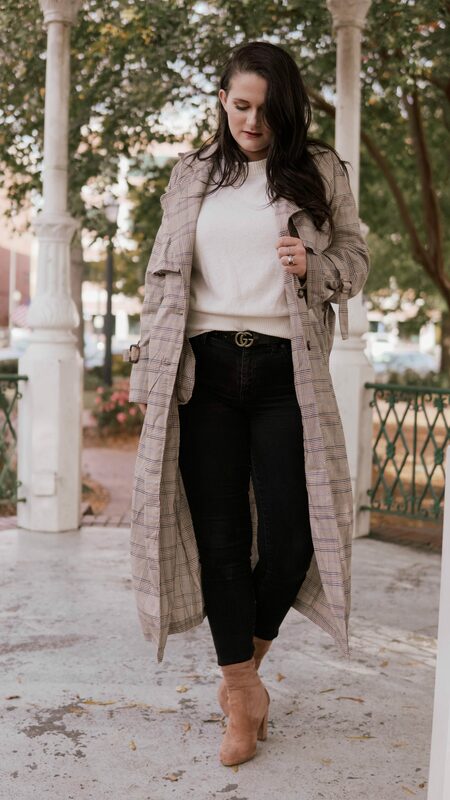 For the outfit here, I styled the trench over a look that I would wear to the office! 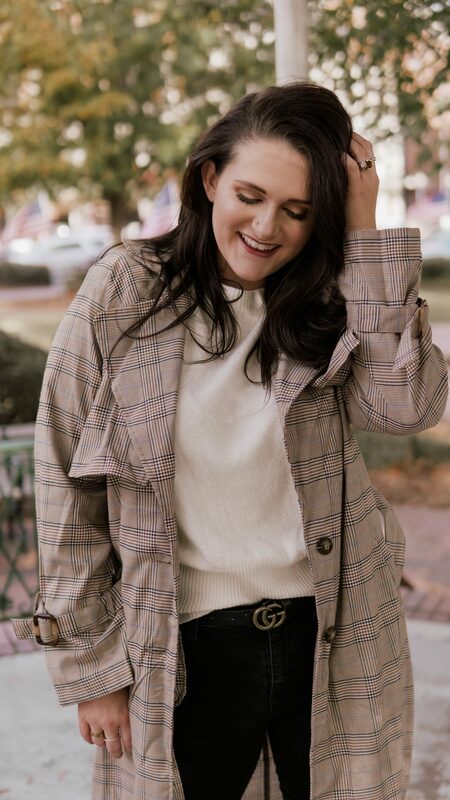 I played into the colors in the trench when picking out my outfit, which is key! While this trench is mostly neutrals, you could easily pair it over bolder colors and prints. This particular coat has some cobalt blue in it, so pairing it over a cobalt blue sweater or dress would be stunning! Speaking of other ways to style the trench, my next top option would have to be over top of an athleisure look. Think a long hoodie, leggings or joggers of your choice, sneakers and cold weather accessories! Perfect for a cold and or rainy day, but also doesn’t sacrifice comfort. Lastly, dressing up a trench coat is especially easy. 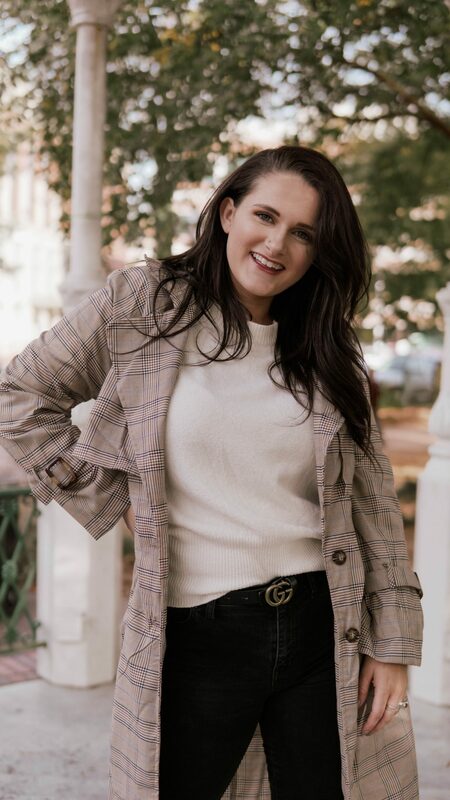 Trench coats are a classic, so if you want to invest in one rather than purchase an affordable one like I did here, this is definitely item to do that with. 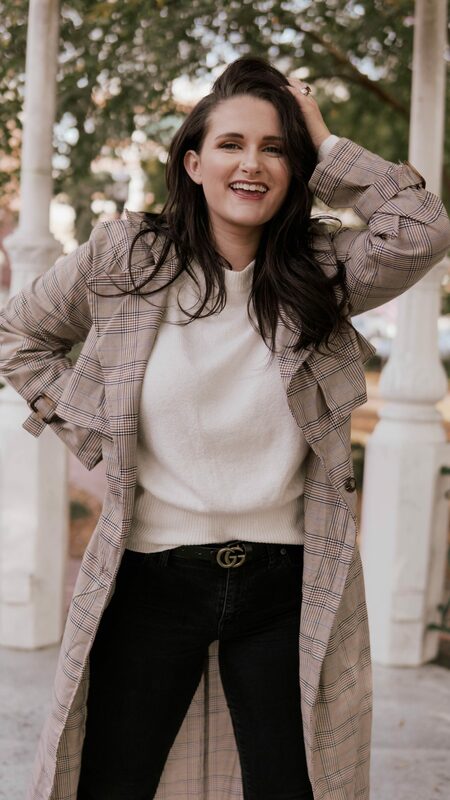 Since it’s the holiday season, the parties are in full force and a trench coat is a great option to wear over your gorgeous holiday looks!